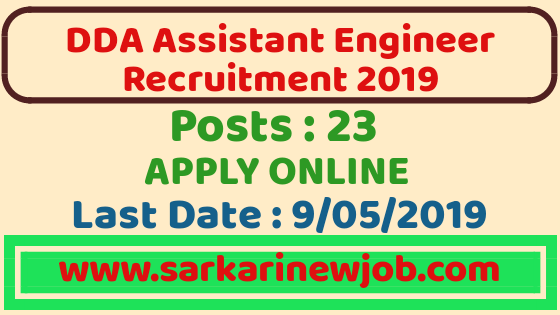 DDA Recruitment through GATE 2019 for Assistant Executive Engineer - Sarkarinewjob.com A ultimate job portal to provide employment news. DDA Recruitment through GATE 2019 – Delhi Development Authority has started application form for the recruitment of Assistant Executive Engineers through GATE 2019. Application form for DDA recruitment through GATE is available from April 10 in online mode.Eligible graduates in Mechanical, Electrical and Civil engineering can fill the applications for DDA recruitment through GATE 2019. Candidates will be eligible for shortlisting for the DDA Recruitment only if they have valid scores in GATE 2019. Further, they will be subject to a selection process that includes a personal interview. Check the detailed vacancies, Eligibility criteria and selection procedure here below. Candidates should have B.E./B.Tech degree in Civil/Electrical/Mechanical Engineering or equivalent from a recognized University/ Institution. Candidates will be shortlisted on the basis of GATE 2019 score. (i) Scan their Photograph (4.5cm × 3.5cm) and Signature (with black or blue ink only). (iv) Have a valid personal email ID and mobile no., which should be kept active till the completion of this Recruitment Process. DDA may send intimation to download call letters for documents verification/ interview through the registered e-mail ID. In case a candidate does not have a valid personal e-mail ID, he/she should create his/her new e-mail ID and mobile no. before applying on-line and must maintain that email account and mobile number during the course of recruitment process. - Photograph must be a recent passport size color picture. - Maximum size of file should be 100kb. - The applicant has to sign on white paper with Black or Blue Ink pen. Home Page>>Jobs> >Direct Recruitment 2019.
b) Candidates will get the instructions page and they will have to accept the terms & conditions by clicking 'I Agree' Checkbox given below and pressing the 'Start' button. d) The One-time Password and login details will be sent at the E-mail ID & Mobile No. provided, so candidates are advised to verify the correctness of the Email ID & Mobile No. before proceeding further. c) On successful submission of on-line application, candidates are advised not to attempt for reregistration for the same post. In case of multiple registrations for the same post, the one with the highest registration number will be considered as the final application. Candidate is required to download the online form generated by the System with unique registration number, which may be retained for future reference.